A new short film from the Coalition for Liberty & Justice shows what happens when religious extremists in the US use religion as a license to discriminate against hospital staff, teachers and other workers who do not conform to the extremists’ views of what is acceptable. This discrimination takes place using your tax dollars. Read more. On September 16, the Coalition for Liberty & Justice held their second forum on religious liberty featuring an intersectional group of speakers on women’s rights, LGBT rights, journalism, medicine, and religion. Panel topics included the media’s responsibility in reporting about religious liberty, how religious doctrine affects the provision of medical services and how recent accommodations allow religious institutions to discriminate. Watch the recording of the forum. May 28, 2014: Hobby Lobby Is Just the Tip of the Iceberg. What Should We Expect? Members of the Coalition for Liberty & Justice convened a press conference to discuss the forthcoming Supreme Court decision on cases brought by Hobby Lobby and Conestoga Wood Specialties. These cases are not just about the Affordable Care Act or exemptions for birth control coverage—they represent a fundamental, national divide about the true definition of religious liberty. A recording of the press conference, featuring Meghan Smith from Catholics for Choice; Rev. Barry Lynn from Americans United for Separation of Church and State; Stacey Long from the National Gay and Lesbian Task Force; Julianna Gonen from the Center for Reproductive Rights; and Terry O’Neill from the National Organization for Women, is available here. Listen to a recording of the press conference. Read Forbes coverage of the teleconference. On February 7, 2014 in Washington, DC, the Coalition for Liberty & Justice convened a forum featuring legal and political experts, religious and community leaders, grassroots organizers and advocates for religious freedom and against discrimination. Watch a recording of the forum. We support the separation of religion and state and believe that public policy should not impose or privilege any religious viewpoint. We support religious liberty and the ability to exercise one’s rights based on conscience, moral codes and beliefs. We support public policies that both respect religious liberty and protect against the use of religious beliefs or traditions to discriminate or undermine equality. We advance religious liberty and justice that respects individuals, supports the common good and reflects the foundational principles of our nation. The US Conference of Catholic Bishops and its ultraconservative allies have been especially vocal in claiming that religious liberty is under threat. But a cursory examination of their arguments shows that they do not stand up to any scrutiny. 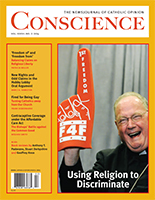 In this issue of Conscience, we have a report on the recent CLJ forum and include articles by several CLJ members who take a long, hard look at what’s at stake in the ongoing debate over real religious freedom. Read the entire issue here. On March 25, 2014, Coalition members urged the Supreme Court to affirm real religious liberty as it heard oral arguments in the cases brought against the Affordable Care Act by Hobby Lobby Stores, Inc. and Conestoga Wood Specialties Corp. In “Towards a Truly ‘Civil’ Society,” Sara Hutchinson of Catholics for Choice and Sammie Moshenberg of the National Council of Jewish Women explain why their organizations set up the Coalition for Liberty & Justice. During a forum on August 21, 2013, “Defending Real Religious Liberty for All,” experts from the Coalition for Liberty & Justice and allies from the international community met to discuss the current state of church/state separation in light of the US State Department’s announcement of the creation of the Office of Faith-Based Community Initiatives, as well as the ongoing litigation over federal contraceptive coverage requirements. Listen to podcasts from this event here.